Garlic (Allium Sativum) is a bulbous plant. It can reach the height of up to 4.5 feet. Garlic is considered a spice, vegetable, and medicine. It is native to central Asia, Africa and Europe. Its use has been tracked back as far as 7000 years. The most utilized parts of the garlic plants are garlic bulbs, which normally divided into numerous sections called cloves. When used in food, it is a fundamental spice in most dishes prepared in Eastern, South and Southeast Asia, Northern Africa, Southern Europe, Middle East and South and Central America. Garlic contains a unique combination of flavonoids and sulfur-containing nutrients, along with other vitamins and minerals. About 20 grams of garlic contains daily values of 15% of manganese, 12.9% vitamin B6, 7.4% vitamin C, 5.5% copper, 4.6% selenium, 3.9% phosphorus, 13.3% vitamin B and 3.2% calcium according to WHF and the George Mateljan Foundation. Other common alliaceous plants such as garlic include onion (Allium fistulosum), leek (Allium odorum), shallot (Allium ascalonicum) and chive (Allium scordoprasum). Fungal infections treatment. Both internally and externally manifested fungal infections do not develop resistance to garlic unlike the case with anti-fungal medications. 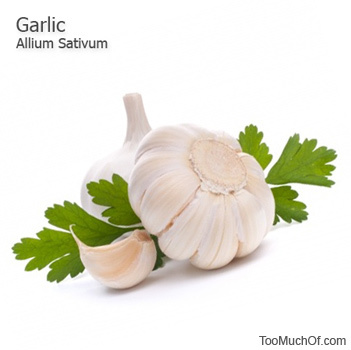 Most frequently garlic saturated oils and garlic extracts are used for infections such as ringworm, athlete’s foot, jock itch, intestinal and vaginal Candida overgrowth. Garlic also has a slight antibacterial effect on H.Pylori infection and can be used as an addition to other anti H. Pylori agents, including antibiotics. Cancers. Daily garlic consumption can be beneficial in helping to prevent various cancers, such as cancers of colon, rectal, stomach, breasts and lungs. High blood pressure, high cholesterol and hardening of the arteries are helped by a regular consumption of garlic. Viral infections, including common cold, influenza and herpes family can be reduced in intensity with a couple of garlic cloves per day consumed with meals. Garlic can also be effectively used topically for various skin infections when used in oil preparations. Blood clots can reduced when garlic is taken internally on a daily basis, which reduces the risk of a heart attack and stroke. Garlic decreases the stickiness of platelets, which are disk-shaped bodies in blood that are necessary for blood clotting. Hair loss can be reduced with a high sulfur content of the garlic. Sliced garlic cloves are massaged into the scalp daily along with onion preparations to slow down the hair loss. Acne can be alleviated when garlic used as a topical agent. Psoriasis flare ups can be reduced in duration by rubbing small amounts of garlic oil on affected skin area. Digestive health can be improved with regular consumption of garlic since it helps to suppress gram negative bacteria and fungus overgrowth. However, a moderate consumption of garlic can also affect the friendly bacterial flora. Parasites manifestations can be initially suppressed by larger doses of garlic, followed by a maintenance dose of 1-2 garlic cloves per day. Although consumption of garlic alone does not necessarily guarantee a complete elimination of various illnesses, garlic has been documented and observed to be one one of the most effective supplements to aid in prevention of various ailments and used therapeutically when combined with other treatment methods. While reasonable consumption of garlic on a daily basis is claimed to be beneficial, excessive use of garlic internally can produce negative impacts on health. Garlic is considered to be toxic. This is mostly due to its sulphone hydroxyl ion component of garlic, which is capable of penetrating the blood-brain barrier, and is toxic to brain cells. Garlic is also highly toxic to dogs and cats and can fatally poison animals. In Ayurvedic medicine, the oldest form of medicine, garlic is not recommended for any substantial treatments. In its raw state, garlic can promote botulism when soaked in oils. Garlic contains a neurotoxin that can cause paralysis of the muscles. Stomach lining irritation is one of the most frequent side effects of moderate garlic consumption. Blood thinning effect is substantial when moderate amounts of garlic are used on a daily basis. It can promote poor wound healing and cause extensive bleeding during a surgery. Garlic supplements and garlic rich foods have to be stopped at least two weeks prior to any surgery. Garlic also interferes with anti-coagulant medications used in surgery. Inhalation of garlic vapors can trigger an asthma attack. Allicin, the compound from a raw crushed garlic can be very irritating to someone with sensitive skin. When skin is exposed too much garlic, it can become red, irritated and sore. As with any substances, garlic can be beneficial and toxic at the same time. Consult with your medical care provider before taking any garlic supplements that may exceed a reasonable dietary garlic consumption.